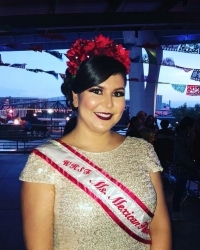 Ms. Mexican Fiesta Ambassador will gain experience and knowledge in many different areas. By becoming a recognized representative for Mexican Fiesta and the Wisconsin Hispanic Scholarship Foundation she will be in the position to make a difference in the community, receive a scholarship to pay current or past school expenses and community notoriety. She will also be committed to attending and positively represent the WHSF/Mexican Fiesta organization at numerous events, from community banquets, parades and volunteer events throughout the year. These events will provide access to network with top leaders of the state of Wisconsin, participate in the events mentioned over a twelve-month term. Valeria Navarro Villegas was born in Leon, Guanajuato. In the year 2000 she, her two younger sisters, and mother immigrated to the United States to reunite with her father in Milwaukee, WI. When she first arrived to the United States, she attended St. Anthony School, then Notre Dame Middle School and Dominican High School. Upon graduating from Dominican High School, she was awarded the Urban Scholars full-tuition scholarship to Marquette University. Valeria has interned in Washington, D.C. through Marquette’s Les Aspin Center, has traveled to Nogales, Arizona for the SOAW Border Convergence regarding immigration and border safety, Valeria has worked for Pete’s Fruit Market as a Marketing Coordinator, worked as a Pretrial Investigator with JusticePoint within the Milwaukee County Jail, and now holds a full-time with Mastantuono & Coffee, SC, a criminal defense law firm, as an investigator.